The Valkyrie was a plane decades ahead of its time, pushing the aeronautical engineering of the early 1960s well beyond what had been thought possible. It was even slated to become the world's first nuclear powered bomber. This wasn't just a hypothetical plan – a Convair B-36 Peacemaker was outfitted with a functioning nuclear reactor and flew multiple test missions in the mid-1950s, several with the reactor running. A huge lead disc separated the reactor from the crew compartment, and the cockpit was lead-lined. The test flights were mainly used to determine the effects of radiation on the plane and the shielding's ability to protect the crew – the B-36 was never actually powered by the reactor. The Soviets ran a similar program using a Tupolev Tu-119. Without nuclear power, how could a large plane go fast enough yet carry enough fuel to complete its mission? After discarding a form that used massive auxiliary tanks filled with boron-enriched "zip fuel," engineers at North American Aviation hit upon a brilliant idea: use the aerodynamic effects of supersonic speed to their advantage. The key idea is called compression lift. The shock waves that form at the leading edges of supersonic planes actually push the plane upward if the shape has been engineered correctly. Particularly at high altitudes, where the air is thin, this results in a huge increase in efficiency. The Valkyrie's final design used huge wing tips that folded halfway down to form a "tunnel" beneath the fuselage, channeling and focusing the shockwaves. The result was a plane that could travel at Mach 3 to a target and still have plenty of fuel for the trip home. At first glance, the Valkyrie doesn't seem to be a plane developed in the late 1950s and early 1960s. The delta wings, forward canards and long, sleek shape seem more at home in the 80s or 90s. In fact, once they'd determined that the plane was physically possible, engineers had to find or develop materials that could withstand such ultra high performance. They didn't have advanced carbon fiber composites to work with. The Valkyrie's body is instead made of stainless steel. A thin skin coats a honeycomb layer that's not only strong, it also dissipates the massive heat generated by supersonic flight. Some surfaces also used a special alloy known as René 41. Two Valkyries were built and tested extensively throughout the 1960s. Unfortunately, other technolgical innovations invalidated the Valkyrie's original reason for existing. By the time it was operational, fighter interceptors were no longer the primary threat to strategic bombers. Ballistic missiles had become effective enough to shoot down planes at the highest alititudes. Worse, the Pentagon didn't need long-range bombers to deliver nuclear weapons anymore. They had ICBMs to do the dirty work. Therefore, the XB-70 ever went into production. The two prototypes flew dozens of test flights, however, and those tests laid the foundation for high-speed, high-altitude flight systems developed in the years to come. The SR-71 Blackbird, B-1B bomber and other military aircraft can trace some aspects of their lineage to the XB-70 Valkyrie. Unfortunately, the XB-70 story doesn't have a happy ending. In 1966, during a mid-air photo session following a test flight, an F-104 fighter clipped the right wing of XB-70 #2. The fighter rolled over the top of the Valkyrie, damaging both wings and vertical stabilizers before exploding. The Valkyrie lost control and plummeted in a flat spin. Pilot Al White ejected but was severely injured, while co-pilot Carl Cross was killed. Joe Walker, pilot of the F-104, was also killed. The video below shows a series of photos shot from one of the chase planes, and depicts the collision, explosion, and the Valkyrie's fall. Sources: Cross, Robin. The Bombers. MacMillan, 1987. Unreal Aircraft. 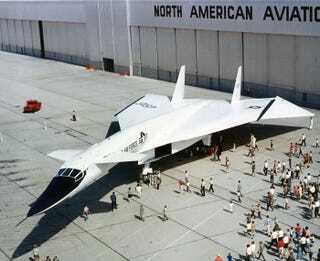 "Lost Classics - North American XB-70 Valkyrie."